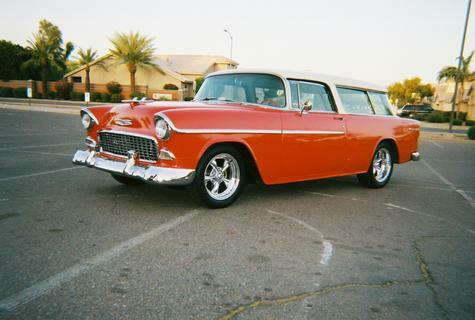 1955 Chevrolet Nomad, to first look at this car, it appears all original, except for the wheels. But start it up and hear the difference. A 3" exhaust is coupled to a 383 cu. in. supercharged motor. putting out about 600 HP. Engine and Engine Compartment: 2006 motor and four speed over drive transmission with 19,000 miles. Street and performance powder coated headers with stainless steel exhaust with Flowmaster 50’s mufflers. Custom built aluminum radiator/condenser/fans/power steering tank and radiator overflow tank/ core support. Dual intercoolers behind the front grill. Very Quick. Body and Paint: Body on the frame build car. California bumpers front and rear. All emblems and front spears original. Original tinted glass. All stainless steel polished. All chrome original except bumpers. Interior: Original with new carpet. Reduced sized steering wheel. Ididit steering column. DVD player hidden under front seat. Wonderbar radio rewired for AM or FM. Chassis/Suspension: Narrowed ford 9 inch with 3:73 gear posi - 36 Spline. Two inch drop spindles and springs. Front sway bar. Front and rear 11 inch rotors/power brakes. American Racing 16 and 17 inch wheels. Neoprene bushings. Rear lights are L.E.D. Power brakes. This car is a frame on car that had NO rust!!! Not any body filler at all, it is painted in original style color, Gypsy Red and India Ivory. This is not a trailer queen, but was built to drive.